Leader of Iran’s Islamic Revolution Ayatollah Seyyed Ali Khamenei has called for further cooperation among Asian states to enhance their strength. 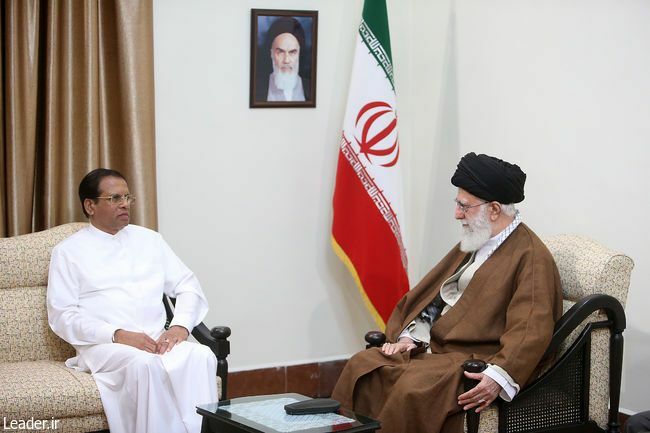 In a Sunday meeting with visiting Sri Lankan President Maithripala Sirisena in Tehran, the Leader referred to the historical and cultural ties between Iran and sub-continent states including Sri Lanka and said the current level of relations between the two states is way lower than the existing capacities. “The Islamic Republic is prepared to enhance its friendship and mutual cooperation with Sri Lanka,” he was quoted as saying in a report by the Leader’s website. Iran’s Leader also underlined the urgent need for implementing the memorandums of understanding signed between Iran and Sri Lanka earlier in the day to boost their mutual ties in various areas. For his part, Sri Lankan President Sirisena gave his government and nation’s warm regards to Iran’s Leader and said during the Sunday talks, the two countries decided to boost their cooperation. He described Iran as the most developed states in technical, scientific and academic fields in the region and expressed the hope that his country could benefit from Iran’s achievements. Iran and Sri Lanka signed five agreements on mutual cooperation in various areas in a Sunday ceremony in Tehran. The ceremony was attended by Iranian President Hassan Rouhani and his Sri Lankan counterpart. The agreements include four mutual cooperation deals as well as a program on cultural exchanges. The two sides also signed an agreement on the film industry, and a cultural deal on cultural and scientific exchanges between the two sides.